Metalcam, a leading developer of Computer-aided-manufacturing (CAM) solutions and maker of Fikus Visualcam, and +GF+ AgieCharmilles, a leading builder of EDM machines, have released a new software solution for the new +GF+ AgieCharmilles Drill 20 machines to ease and automate the EDM drilling programming. Integrated on board the machine’s CNC Control, this new software solution, to be commercially sold as ACcam.drill will be offered by +GF+ AgieCharmilles sales, subsidiaries and partners as an option to the new Drill 20 machines. 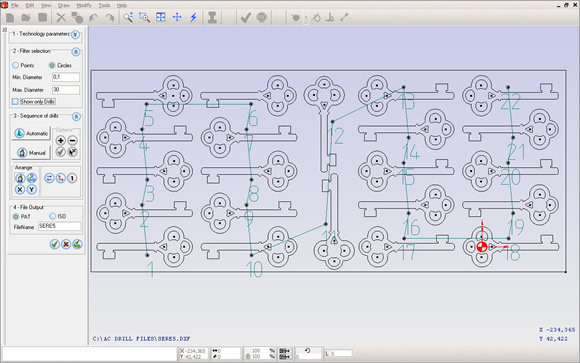 ACcam.drill offers the user the possibility to import a DXF or G-Code file and also to create or modify the geometry. With the 4-step dedicated Drilling Wizard, connected to the machine’s drilling condition database, the optimized drilling sequence will be generated fast and easily. The user can choose the output between an ISO file containing the drilling positions or the specific PAT file which also includes the EDM impulse code. The 'Drill 20 is a production machine designed for the drilling of parts in hard materials such as hardened steel or carbide. Its drilling capability ranges from 0.3 to 3.0 mm diameter through a depth of 200 mm. Particularly simple and easy to use, the 3 axes (X, Y, Z) numerical control makes it possible to program a series of holes for fully automatic machining. The new powerful fully CNC Windows Control with Touch Screen enables ACcam.drill to be operated very intuitively with just one finger. ACcam.drill has been especially developed keeping in mind the Touch Screen possibilities of the new CNC. The Drill 20 CNC Control also includes the following main features: Intuitive easy to use interface, fast job setup, advanced feature for multiple holes, positioning data import, network connection, and online user manual on board. By combining the high performance capabilities of AgieCharmilles's machines with Metalcam's leading-edge software solution, customers will significantly benefit from manufacturing quality parts, setting new standards for speed and flexibility. Maria J. Gil, international sales manager of Metalcam, comments “We are excited to partner again with AC , which is revolutionizing the way machines are designed and built. We believe that this cooperation will bring machine users a considerable increase in efficiency.”. GF AgieCharmilles is the world's leading supplier of machines, automation solutions and services to the tool and moldmaking industry as well as to manufacturers of precision parts and components. GF AgieCharmilles' products range from electric discharge machines (EDM), laser ablation, high-speed (HSM) and high-performance milling (HPM) centers through tooling, services, spare parts, wear parts and consumables to automation solutions. As a globally active company, +GF+ AgieCharmilles is part of the Swiss Georg Fischer Group and has 50 sites worldwide. Its 2,543 employees generated sales of CHF 578 million in 2009. For more information about GF AgieCharmilles, visit the website www.gfac.com. Metalcam S.L. is a leading developer of CAD/CAM solutions for tooling and production. Through its flagship product Fikus Visualcam, Metalcam provides solutions for Wire EDM, Milling, Lathe, Millturn and NC Cutting & Routing applications to ultimately shorten product delivery time. Worldwide, more than 3,000 customers, in different industries, from production to automotive, employ Metalcam’s leading CAD/CAM solutions for manufacturing. Founded in 1991, Metalcam S.L. is privately owned. Metalcam’s extensive distributor network are located in over 30 countries to serve customers worldwide with complete pre- and post-sales support.